Plans are underway for the garden. 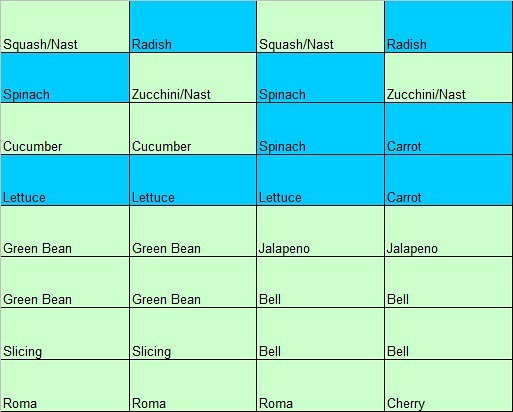 I've decided on my veggies and have ordered seeds. I have a 4x8 foot garden and have the planned out my planting schedule and location for all the plants. The blue squares will be planted in mid February. The goal is that when these are done the squash and zucchini will be at their taking over point and there will be plenty of room for them to grow. The nasturtium will also go in the same square as the squash plants to hopefully ward off vine borers. I consulted the Aggie Extension Office again this year to pick varieties that will work with the area I'm in. Straight Eight Cucumbers that I plan on trellising. I ordered the majority of my seeds from Baker Creek Heirloom Seeds. You really just can't beat their prices/seed quantity, the selection is great and they offer a lot of organic and heirloom seed options. I also ordered a few from Park Seed Company for the first time. Again, their price was great. I'm getting the cucumber, jalapeno and Salad Bowl lettuce from Burpee. I was actually able to find almost all my seed choices from Burpee, but they're really expensive (about a $40 difference between them and Baker Creek). The cucumbers I could have gotten from Park Seed, but they would have pushed my order back too late and I'd like to get the tomatoes I'm ordering from them started sooner rather than later. I will actually buy the Burpee seeds in store because their shipping is also high. I'm going to get my seed starting kits in store anyways so it's no big deal. So what are your garden plans? We need to start thinking about our garden too...last year we sort of followed the square foot method, but the tomatoes and zucchini ended up just being a huge jungle, and they took over everything. It was hard to harvest our crops, because it was almost impossible to see what was ripe. Last year, I did a ton of seed starts, but then I also ended up buying a bunch of starts from the high school FFA sale, and those did WAY better than my starts...and at 50cents or a dollar each, I think it might be worth it just to stick with those. We'll see!